If there was ever a time to get a Suzy Kuzy, the ridiculous all in one glove and beer cooler, it’s for Fourth of July Weekend. Bro-out for cheap and celebrate our nation’s independence using promo code SPIN50 and save 50%. That’s just $9.99. You can prep your Fourth of July party with Suzy Kuzy’s for all your guests (sets of 10 cost just $6.99 per kuzy), or simply make your presence felt at the biggest summer party armed with a beer-holding conversation starter. Whether people are confused or envious, it grabs attention. You’ll have a blast keeping your beer cold while having more freedom to flail your arms while telling your next drunken tale. The fingerless neoprene glove is attached to a kuzy so as your grip loosens on your beer, the beer remains as cold and secure as ever. 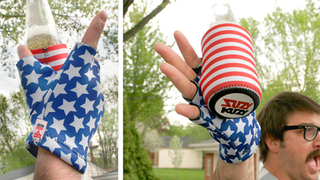 Get the stars and stripes mitt which is perfect on any summer day. It’s weird and ridiculous, it’s a Suzy Kuzy. Grab one at 50% off using promo code SPIN50 and then grab a cold one.